We have made our way to Colombia, after traveling and pet sitting in Panama City. Our first stop was Medellín, Colombia. Medellin travel wasn’t on our list at all, but friends persuaded us to go. We’ve been to a lot of countries, cities, and towns this year, but we haven’t felt the same way about them as we do Colombia. We fell in love with Medellín at first sight, and it gave us the best first impression. It’s a vibrant city in the midst of a major transformation. That is what makes it so exciting. From a city plagued by the violence of the drug cartels in the 80’s and 90’s to a city investing in education, culture, art, museums, start-ups and a world-class transit system to connect and access people of all areas of the city together. 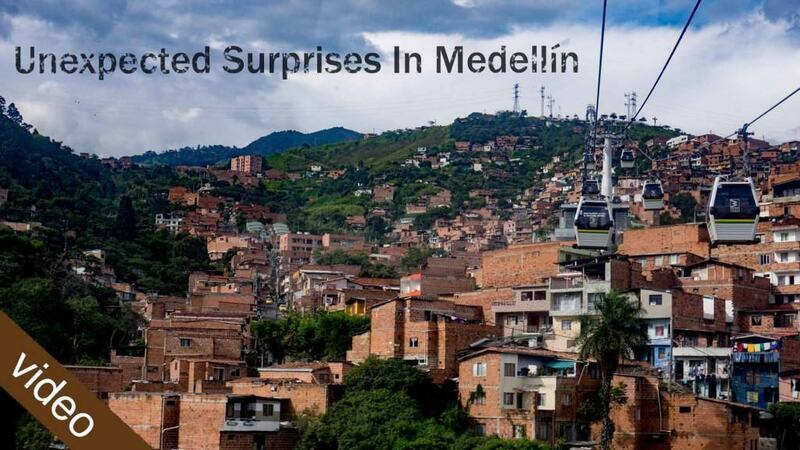 And Medellin has won awards for its progress. In 2013, it was named the most innovative city in the world in the Wall Street Journal’s City of the Year Contest. The people here are incredible. They are so proud of their city, and happy foreigners are visiting. They offer help, assistance and on several occasions have gone out of their way to show off and tell you about their city. -Parque Arvi – a huge green space at the top of the mountains high above the city, only accessible by Cable car. – Ride the Metro cable car with sweeping views of the Aburrá Valley. – Wander downtown via the Metro to see the Fernando Botero sculptures, Visit Cisneros Square and Berrio Park. – View the biggest transformation, Comuna 13, most violent and troubled neighborhoods in the past and seeing the incredible graffiti representing the recent history of the area. Medellín has also become a place of opportunity for us. We have made some excellent connections in the tourism and start-up industry, and we were working on some exciting marketing and video projects. Much more to come on that. We are now in Cartagena, our last five days in Colombia. We leave for Panama to explore the country a little more before flying out to see our families in Canada for Christmas. But we did come back to live in Medellín and explore Colombia for 4 months. For more posts about Colombia, you can find them here.